Hobbyking is selling a miniature version of the Ardupilot APM 2.5 flight controller. This board features a HMC5883L compass, MPU-6000 gyro/acc, MS5611-01BA03 barometer sensor as well as a ATMEGA2560 8-bit microcontroller. The only problem is, things have moved on with the introduction of the PixHawk flight controller. And at a price of USD $83.- without GPS or telemetry the MegaMini is not exactly a bargain offer either. The fact is that the 8-bit APM platform will not see much new development over the next few years, so you better be content with the current state of affairs for there won’t be much in terms of revolutionary new updates for this platform. Regardless, if you yearn for a more portable (even if slightly outdated) APM, the MegaMini is up for order on the HK website now. And who knows, maybe the price will drop down a bit, making this a good alternative to the T1000FC to throw in to your everyday model as an automated return-home and recovery system. Big changes are coming to the ground control software for the APM platform: the APM Planner team just released v2.0 RC1 of their new software. Based on QGroundControl, it blends in the classic APM Mission Planner user interface which means it’s immediately familiar to MissionPlanner 1.x users. Of course this release is timed along with the recent start of sales of the Pixhawk flight controller and the IRIS drone system by 3DR. While this software uses Mavlink like the old versions, do note that compatibility with MegaPirateNG is not guaranteed. In our tests, flight operation worked fine but trying to change PID parameters causes unknown parameter errors. This may well be an issue with the current SVN versions of MegaPirate. Of course original APM 2.x and Pixhawk flight controllers are fully supported. 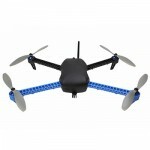 The 3D Robotics IRIS drone is now available for preorder. It’s meant to be used as a serious drone for civilian users, offering complete waypoint flightplans via PC or smartphone/tablet. Unlike DJI, their products are often open-hardware and open-source, which explains why 3D Robotics chose not to gimp their flight controllers or restrict them to a small number of waypoints. Indeed, the IRIS uses the new Pixhawk autopilot system while retaining compatibility with the ArduPilot Mission Planner (APM). The IRIS is one of the cheapest available professional drones with full waypoint support at a preorder price of just over USD $729.- , depending on selected options. This includes integrated 433MHz or 915MHz telemetry. More pictures and technical data after the break. Making an autopilot for an RC plane is hard, which is why ArduPilot has taken a long time to become what it is now. 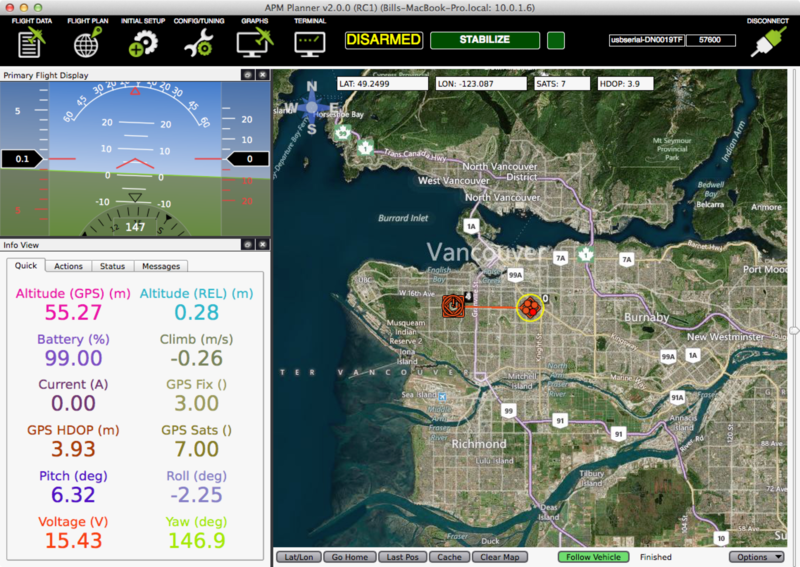 Larry Grater now demonstrated the successful use of ArduPilot to automatically guide an RC plane dropped from 30.780 meters, or 101.000 feet. Larry didn’t just upload a flight plan via APM, there were quite a few obtacles to tackle for ArduPilot to be able to pilot the plane at such altitudes. Um.. alright. One thing to note: Most GPS modules don’t work above 18km altitude, due to the military being afraid that you might build your own ICBM or something. We don’t know if Larry circumvented this issue by having the plane take a steep dive down to 16km altitude or if he had a GPS module that is not altitude-restricted, but in any case, the plane successfully reached each of the programmed waypoints before loitering down to the ground.